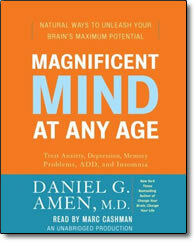 Magnificent Mind At Any Age – Audio CDs by Daniel G. Amen – Discount! It all starts with your brain: how you think, how you feel, how you interact with others, and how well you succeed in realizing your goals and dreams. When your brain works right, so do you. When it’s out of balance, you feel frustrated, or worse. Yet amid all the advice that bombards us daily about how to keep the rest of our body strong and healthy, we hear very little about how to keep the most complex and magnificent organ of all—the human brain—in top working order. Based on the most up-to-date research, as well as on Dr. Daniel Amen’s more than twenty years of treating patients at the Amen Clinics, where he and his associates pioneered the use of brain imaging in clinical practice, Magnificent Mind at Any Age does exactly that. To achieve this, as Dr. Amen explains here in clearly accessible language, we have a range of options available, including proper diet, natural supplements and vitamins, exercise, positive thinking habits, and, if needed, medication. In addition to revealing how we can all take advantage of such strategies to enjoy the benefits of a balanced and healthy brain at every stage of our lives, Dr. Amen also pinpoints specific ways to tailor behavior, nutrition, and lifestyle to deal effectively with common mental challenges such as memory problems, anxiety and depression, attention deficit disorder, and insomnia. Whether you’re in the midst of a demanding career or are looking forward to an active and richly rewarding retirement, Magnificent Mind at Any Age can give you the edge you need to live every day to your fullest potential.